The key to reading the shooter is seeing where the shooter is holding his or her stick. If their stick is out in front of them it usually means they are going to deke, its pretty hard to get off a good shot if [the shooter is] holding the puck in front of [him], so if you see that the shooter pulls the puck back to the side of their body it is likely that they are planning to shoot. If you compete with the same players regularly you can use what you know about their skill levels do your advantage. Can the shooter aim the shot exactly where he wants it to go? How are his stick handling skills? How about skating? Can he stop or reverse directions easily? Studying your opponent’s abilities can help you be a better goaltender because you can influence him to use his weaker skill. A follow-up post tells you how to do this. If you want the shooter to deke you want to come out pretty far so that they don’t have anything to shoot at and have to deke. If they decide to shoot anyway you should have your angles covered and it should be very difficult for the shooter to snipe on you. If you would prefer to have the shooter take a shot rather than deke, you might not want to come out as far. 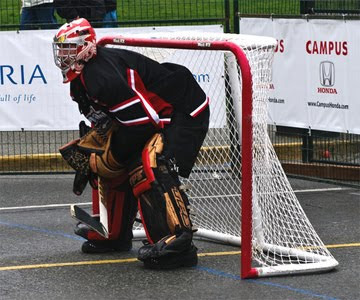 As you cover the net more you will learn more about your own reaction time, flexibly, and how to close the gap at an even pace. This entry was posted on on April 10, 2010 at on April 10, 2010 and is filed under skills. You can follow any responses to this entry through the RSS 2.0 feed. You can leave a response, or trackback from your own site.